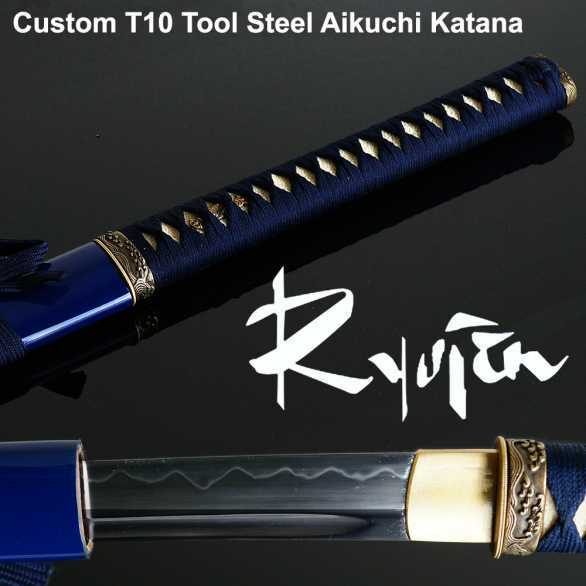 Affordable, traditional and with some cool custom options - the entry level Ryujin T10 Aikuchi Custom Katana takes a high quality T10 tool steel blade with real hamon and lets YOU choose whether or not you want it with bo-hi (for a faster sword) or no-hi (for a more powerful cutter) and then lets you select from 3 tsuka (handle) and 3 saya (sheathe) combinations to make it uniquely your own. 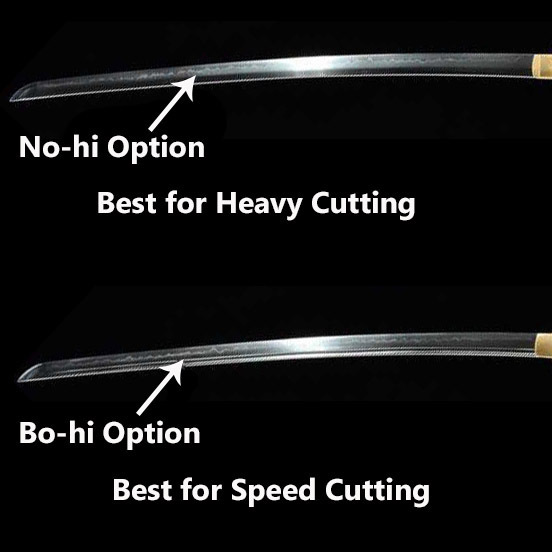 The ONLY difference between this sword and the others in this series is this one is a sleek lined Aikuchi Katana without a tsuba, but has instead high quality tsunami wave themed brass fuchi and kashira and slightly less customization options. That and the price of course, being $30 less than the full custom option. PLUS you get your choice of one of four designs of a Premium Quality Sword Bag which we usually sell for $19.99 here in the store! 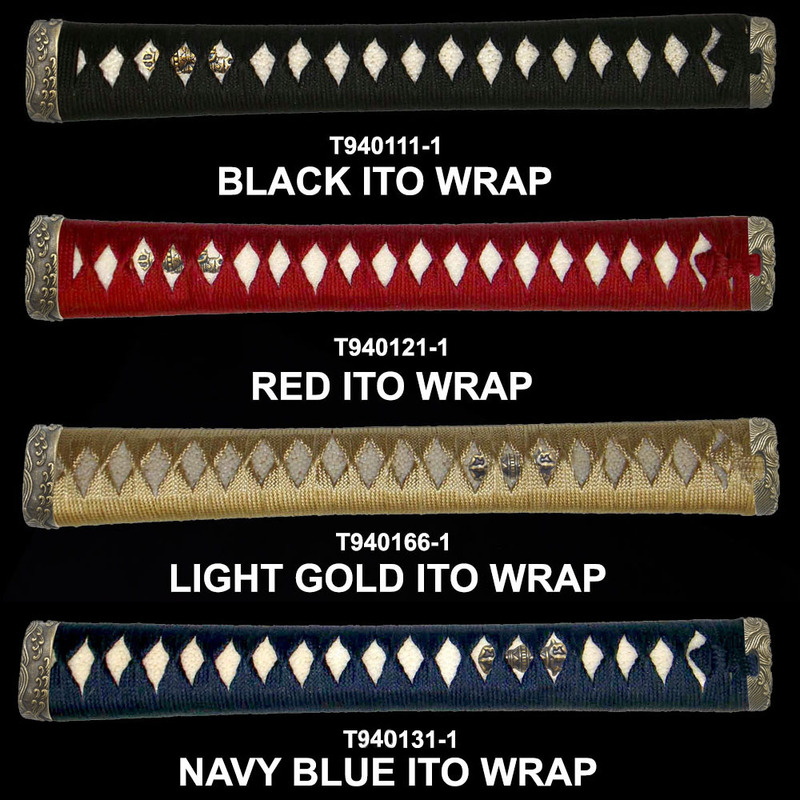 The Aikuchi (meaning 'meets at the mouth') style of Japanese sword mounting was quite common on Tanto and Wakizashi, but was also historically seen on Katana. It was most popular during the Kamakura Jidai (1185-1333) as it facilitated wearing the sword closer to the armor than what was possible with a tsuba. In later periods it was favored by the nobility - in particular the Daimyo Uesugi Kenshin (1530-1578). This style without a tsuba was also called koshigatana koshirae. In recent years Australian designer Mark Newson teamed up with traditional swordmakers in the Tohoku region devastated by the 2011 earthquake to make a luxury Aikcuhi Katana that sold for $300,000. 27.5" blade with 11" handle. Weight 2.1lbs (with bo-hi) 2.3lbs (no-hi version). Differentially hardened fully sharpened T10 Tool Steel blade with real hamon. Solid brass fittings cast with tsunami wave theme. 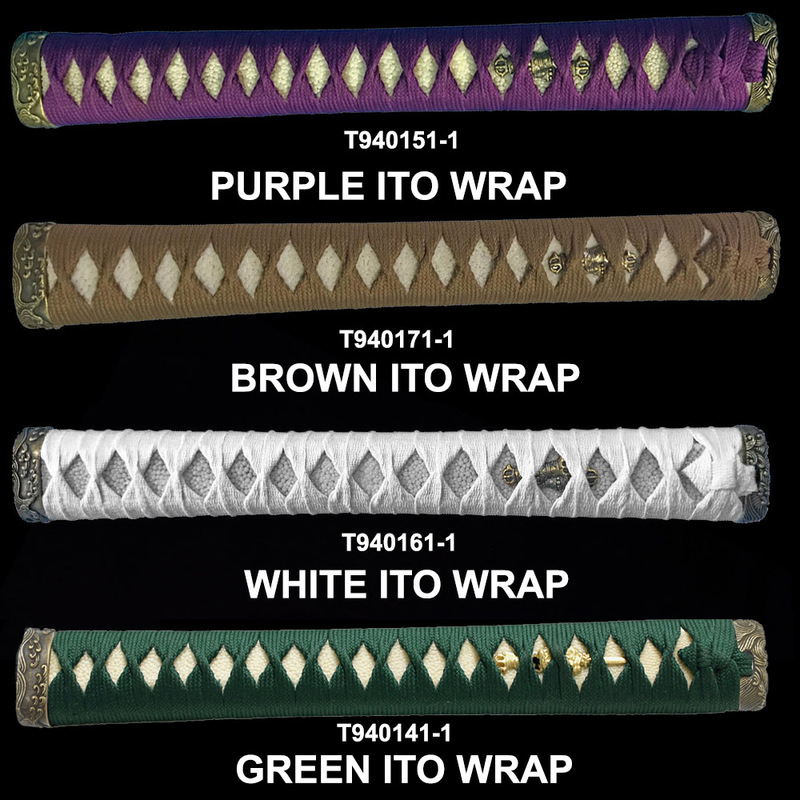 Colored Rayon wrapped ito over authentic rayskin in 6 different styles with brass tsunami themed fittings. Wooden lacquered saya in your choice of 5 colors and styles. 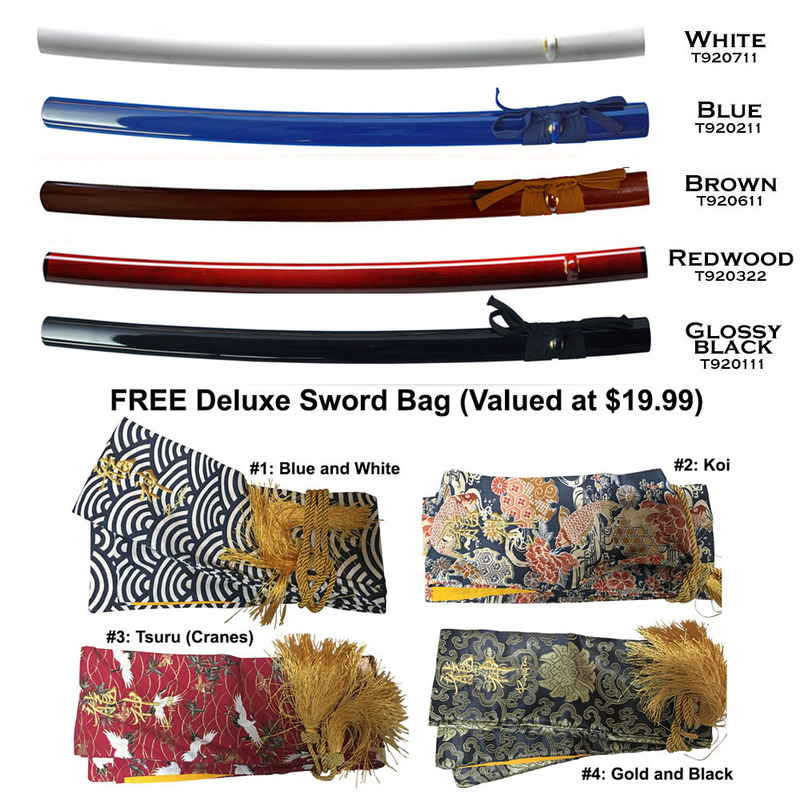 PLUS your choice of one of four Deluxe sword brocade bags valued at $19.99! This sword was purchased as a gift for a friend. The package arrived on time and was delivered by UPS in good condition. Opening the package, I was happy with the Sword Bag (Koi). The Ryujin Logo is on the bag, made of wire, but the bag is two ply with a gold inner cloth. As for the sword itself, the Saya seems darker than the picture would indicate. Nothing drastic, just noteable. The mekugi closest to the tsuba does seem to be buried into the sting ray panels, this is my reason for 4 stars and not 5. I would have perfered a flush pin and I always find something like this spooky when it comes to cutting. The saya does have a very small imperfection but with it being the size of a pinhead, I only mention it to help others know what to possibly expect. Drawing the sword, it does feel tighter than it should be but it certainly will not slip out if held at an odd angle. Lacking the tsuba to push with the thumb the sword could stand to be a touch looser but I feel this will wear away with time. I am not certain of this but the sword feels heavier in the hand, I am thinking that the tsuba adds a good amount of balance to the blade so when I picked the sword up it felt more like a two handed sabre than a katana with more weight forward than back. Overall I am very pleased with the sword and it is my hope that my friend enjoys it as much as I do. I hope this have been informative. Our responseSaya can and do tighten or loosen depending on atmospheric conditions different from where it was made or assembled. If adjustments are needed, this article is helpful.